A budge in carbon budgets? A new scientific paper last week seemed to have some good news on climate change: keeping warming to 1.5°C – the goal of the Paris agreement – may be less difficult than previously thought. Not that it removes the urgent need to decarbonise; rather, as lead author Richard Millar of Oxford University put it, “although 1.5°C is not yet a geophysical impossibility, it remains a very difficult policy challenge”. The paper estimated that the remaining “carbon budget” is much higher than was previously reckoned. A carbon budget is a measure of how much the world can afford to cumulatively emit in total in the future, while keeping warming below a given level. Millar also wrote this non-technical overview. We in Oil Change International have used carbon budgets to inform what needs to happen to the fossil fuel industries. Our Sky’s Limit report last year found that the oil, gas and coal in already-producing fields and mines (where the wells have been drilled, the pits dug, the pipelines and terminals built, the capital invested) would be enough to take the world beyond 2°C of warming. Even if coal extraction and burning were stopped overnight, the oil and gas alone would take us beyond 1.5°C. The report concluded that the world must stop developing new fields and mines, stop building fossil fuel infrastructure, and instead focus on a rapid and just energy transition. In the Sky’s Limit report, we used the carbon budgets given in the IPCC’s Fifth Assessment Report (AR5) – Table 2.2 of the Synthesis Report, to be precise. We will continue to use those numbers as our principal reference, because they represent a broad agreement among the scientific community, informed by and reconciling numerous individual papers. While Millar and his co-authors are experts in the field, and their paper was peer-reviewed, some other scientists have criticised the approach, on which more below. The findings will continue to be debated over the coming months and years, including in new peer-reviewed studies, and these debates and studies will, along with Millar’s, feed into the process of compiling the IPCC’s Sixth Assessment Report. However, in this blog, let’s consider what the new paper would mean for our analysis if it turns out to be right. We’ll start with a quick summary of what the paper says. Carbon budgets are generally calculated by using earth system models – basically, computer programmes that simulate the physics of the atmosphere – to estimate the quantity of emissions, beginning in pre-industrial times, that would cause a given level of warming. Taking off what has been emitted to date tells us how much more can be emitted as of now. There are several uncertainties in the precise numbers, related to the complexity of the climate system, differing datasets on temperatures, and even uncertainties in the amount of historic emissions. Millar et al tried to factor out the historical uncertainties (in both the climate system and the emissions record), by starting the models from now (well, 2015), rather than from the Nineteenth Century. They estimated that the world has warmed about 0.9°C since pre-industrial times, and so used the models to estimate what emissions from 2015 would cause a further 0.6°C of warming. Predictably, the tabloids and trolls jumped to claim the paper showed that climate models were wrong (and alarmist etc), a claim that was refuted in detail by Zeke Hausfather of U.C. Berkeley, and more briefly by the paper’s authors. However, it does potentially raise wider questions about climate models and parameters, as discussed by Glen Peters of CICERO. The estimate of 0.9°C warming that has happened to date is based on one dataset (the Hadley Centre’s HadCRUT4) that generally gives lower estimates compared to others, as it excludes measurements of much of the arctic, where the greatest warming has taken place. Gavin Schmidt of NASA points out that other datasets suggest warming to date of 1.1 to 1.2°C. Millar et al referred to 0.9°C of warming since the base period 1861-1880, whereas the Industrial Revolution began in the second half of the Eighteenth Century, nearly a hundred years earlier. Stefan Rahmstorf of the Potsdam Institute for Climate Impact Research estimates that pre-industrial temperatures were 0.2°C lower than those of this base period. The models predict air temperatures, whereas observations are based on a combination of air temperatures and sea temperatures, which leads to a mismatch because seas are warming more slowly than the air. Zeke Hausfather observes that this makes a further difference of nearly 0.1°C. Putting these three factors together would suggest the 1.5°C limit equates to as little as a further 0.1°C. As Rahmstorf puts it, “the assumption by Millar et al that we still have 0.6 °C to go up to 1.5 °C is at the extreme high end of how you might estimate that remaining temperature leeway, and that is one key reason why their budget is large”. However, while 0.6°C was their headline figure, the authors also gave estimates for a range of different amounts of further warming (in Table 2 of the paper). So we can do some comparisons. In the Sky’s Limit, we estimated the CO2 emissions from developed reserves of oil and gas at 517 Gt, and coal at 425 Gt CO2 as at start of 2016. We estimated that land use change and process emissions from cement manufacture could add a further 183 Gt from 2015 to 2100. These are compared in the chart below with three different carbon budgets: one from the IPCC’s AR5, one from Millar et al’s paper assuming a further 0.6°C of warming, and one from Millar et al assuming a further 0.3°C of warming (around the middle of the range discussed above). These all relate to January 2015, so as at September 2017, the budgets are about 110 Gt smaller than this [1(ii)]. What does this chart tell us? If for the reasons above we assume that the 1.5°C goal translates to 0.3°C of further warming rather than 0.6°C, the carbon budget is unchanged from the IPCC estimate. Alternatively, even if we accept the high end of 0.6°C, developed reserves of oil, gas and coal would still take us beyond 1.5°C. Millar et al’s paper does not make any estimate of the carbon budget for staying within 2°C; however we can add 0.5°C to the 0.3°C further-warming estimate above – ie to look at the budget for an additional 0.8°C, in the chart below. (The paper did not give an estimate for a further 1.1°C, which would be the equivalent of the assumption that the 1.5°C limit means a further 0.6°C). In this case, using Millar et al’s estimates (but a more modest translation into future warming) increases the 2°C budget compared to the IPCC value. 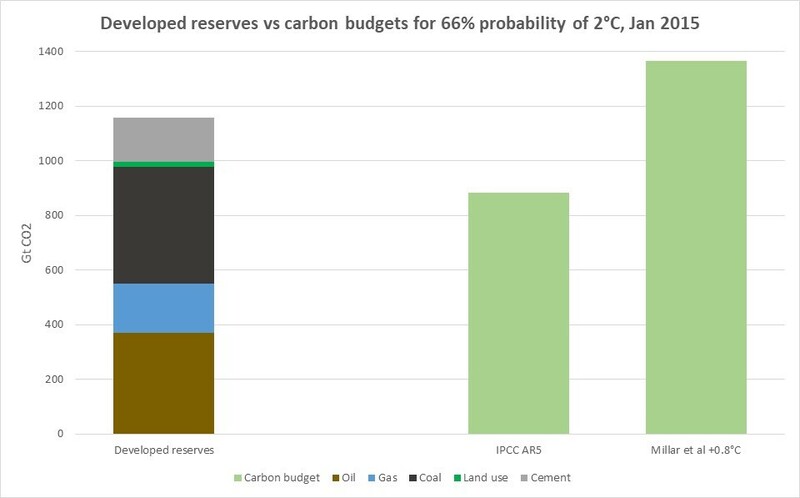 Here developed reserves together with fairly optimistic projections of land use and cement emissions would leave 200 Gt of carbon budget available for development of new fields or mines, as of January 2015 – but more than half of this excess has been used already since then. A higher-end estimate of remaining tolerable warming would give a few years’ more space for new development – if we bet on every unknown going our way, and if we wrote off the Paris goal of 1.5°C, and with it the prospects of survival for some of the world’s most vulnerable nations. So, in summary, these new numbers will certainly be debated further. If they turn out right, my colleague’s reaction sums up the implication: “This is actually making me pretty happy. I’m all for being less immediately doomed”. And with that, we can begin the managed decline of the fossil fuel industry, with a hopeful smile. (i) Tonnes of carbon or of carbon dioxide? Millar et al’s paper cites budgets in tonnes of carbon. We have instead used tonnes of CO2, in line with the more common usage in non-scientific literature. One tonne of carbon equals 3.67 tonnes of CO2. (ii) Start date? Since budgets are depleted over time, it matters which date a budget refers to. 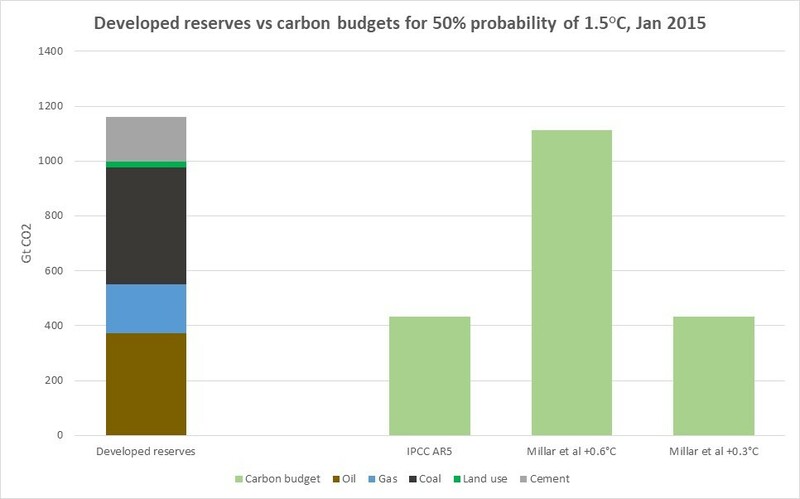 The IPCC’s AR5 gives budgets as at end of 2011, Millar et al’s paper at start of 2015, and the Sky’s Limit start of 2016. In this blog we’ve adjusted all to what they were at start of 2015 for comparability, by adding or subtracting the emissions that occurred in intervening years, as recorded by the Global Carbon Project. (iii) Probability of success? Since models are representing a complex system, there is some variation in their estimates – for this reason scientists refer to a probability of staying below a given temperature limit (or more precisely, the proportion of model runs that deliver that outcome). In the Sky’s Limit and in this blog, we use budgets for a 66% probability of staying below 2°C, the highest published by IPCC (since it is seen as an absolute maximum tolerable, a defence line that must be stringently defended). For 1.5°C, we use a 50% probability, since it is more of a goal, which governments agreed in Paris to “pursue efforts” to achieve. (iv) Assumptions about non-CO2 emissions? Carbon budgets relate only to CO2, and not to shorter-lived greenhouse gases (GHGs) such as methane. The estimate of a carbon budget depends on what assumptions are made about emissions of non-CO2 GHGs. In this blog, we assume non-CO2 GHGs follow the IPCC’s RCP2.6 scenario, which assumes robust action to reduce those emissions. (Millar et al give both this scenario, and another assuming very little action to reduce non-CO2 GHGs, namely RCP8.5).